The die-and-box trick, so often performed on the stage, is a very interesting and mystifying one. The apparatus, however, is simple, consisting of a box, die, a piece of tin in the form of three adjacent sides of the die, and a hat. The die and box are constructed entirely of wood, 1/8 in. thick, and the piece of tin can be cut from any large coffee can. The box is closed by four doors, as shown in Fig. 1, two of which are 2 3/4 in. square, and the others, 3 1/8 in. by 3 1/4 in. The first two are the front doors and are preferably hinged with cloth to the two uprights A and B. Small pieces of tin are fastened on the doors at C and D, to provide a means to open them. The other doors are placed on top and are hinged to the back, as shown. The die is 3 in. square on all sides, and is constructed of two pieces, 3 in. square; two pieces, 2 3/4in. by 3 in., and two pieces, 2% in. square. These are fastened together with 1/2-in. brads. The tin, forming the false die, is cut out as shown in Fig. 2, and is then bent on the dotted lines and soldered together on the joint formed by the two edges E and F. All parts should be painted a dull black with white spots on the die and false die. Procure a hat from some one in the audience and place in it the die with the tin false die covering three sides of the block, at the same time telling the audience that the block will be caused to pass from the hat into the box, the latter being placed some distance away. Inform the audience that it would be more difficult for the die to pass from the box into the hat. Remove the tin piece from the hat and leave the die, holding the surfaces of the false die toward the audience. This will give the impression that the die has been removed. Set the hat on the table above the level of the eyes of the audience. 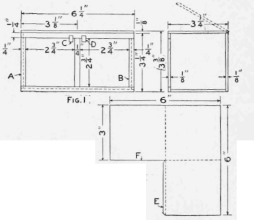 With the back of the box toward the audience, open one top door and insert the tin piece in the right-hand compartment so that one side touches the back, another the side and the other the bottom of the box. Close the door and open the two doors of the opposite compartment which, when shown, will appear to be empty. Tilt the box to this side and open the doors of the side opposite to the one just opened, which, of course, will be empty. This should be done several times until some one asks that all doors be opened at the same time. After a few more reversals and openings as given, open all doors and show it empty, then take the die from the hat. - Contributed by Harold L. Groes-beck, Salt Lake City, Utah.